We think sitting in contemplation with a pair of warm baby animals in our laps is the best interactive technology for young hearts and minds. But we are also in the business of developing screen content for children, and contemporary research on this topic is important. A recent study by researchers at Vanderbilt University gives much food for thought on the way children interact with a touchscreen. 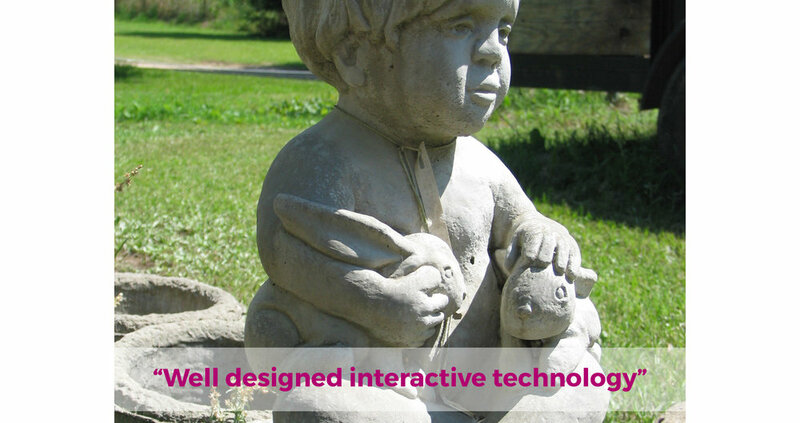 As a result of their research they advise "given young children’s limited ability to regulate their own attention and actions, developers of children’s media must think about using interactivity in ways that benefit, rather than hinder, learning. In a recent study with toddlers, for instance, Strouse and Ganea (2016) zeroed in on differences between more and less helpful interactivity for this age group: very simple interaction, such as having to tap on an object to turn the page, helped toddlers learn a word, but if the tap elicited an engaging but “off-topic” visual and auditory reward, children’s learning suffered." Russo-Johnson, Troseth, Duncan and Mesghina 2017 show that "lower socioeconomic status children (defined as children whose parents had less education) learned better in the challenging condition that required dragging named objects, compared to the condition that called for a tap response. Well-designed interactive technology holds great promise for giving children from less advantaged families additional engagement with educational content, particularly as touchscreen devices have now become prevalent across all income levels (Kabali et al., 2015)."